Assigning Resources to fit right time! Let’s say I have a project for performing a testdrive on a prototype car. The testdrive project itself is made up by a series of tasks. 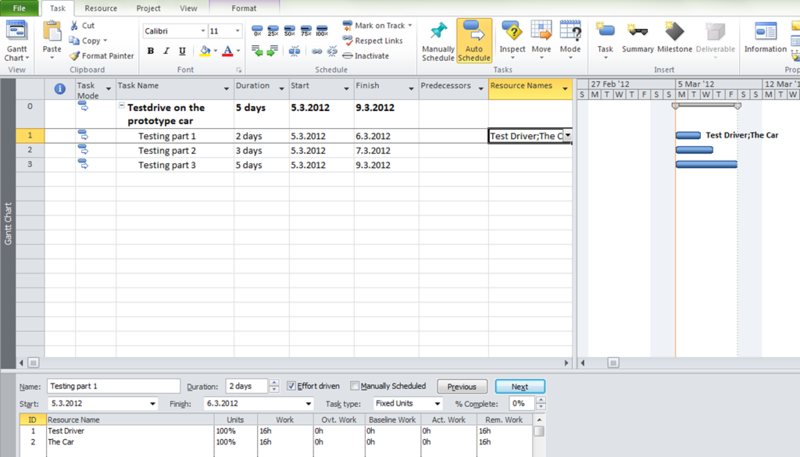 The tasks need to be performed by a testdriver (work resource) but he also needs the car to do it. So the testdriver is one resource, the car is the other. 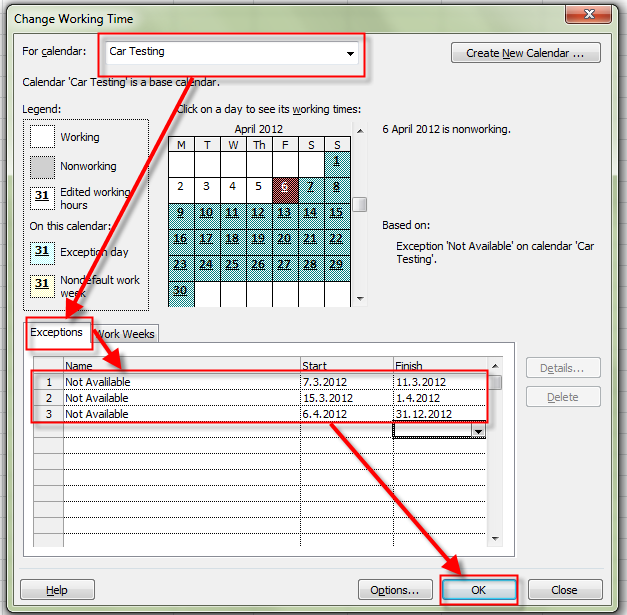 I both need them to perform the task, assigning the car resource to the same tasks as the testdriver should not reduce the time it takes to perform the task or should not reduce the workload of the testdriver. Also another difficulty, the car is not available constantly (it is used by other divisions of the company) so I would like to auto schedule the tasks according to the availability of the car. Lets say the project takes 10 days in total, but the car is only available 2 days in the first week, 3 days in the second week and 5 days one moth later. OK! Let me fix this issue. First let me do the setup. 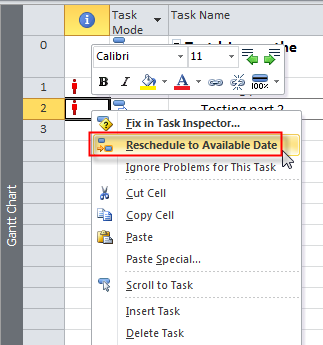 I will use Task Calendar! 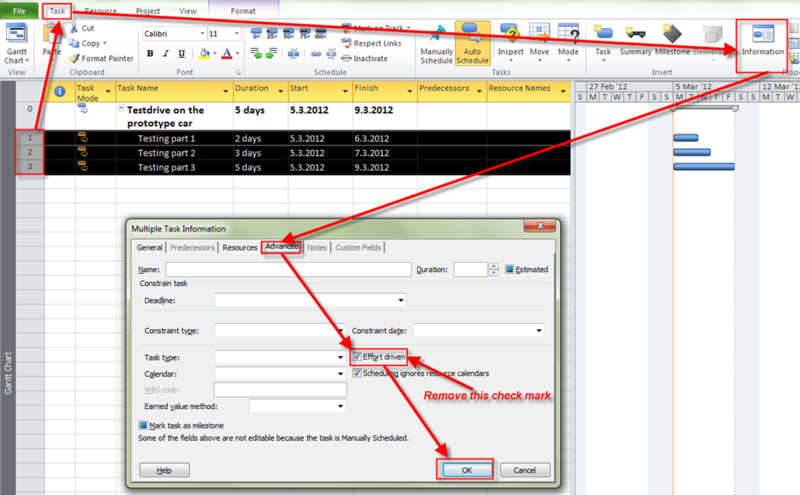 Suppose that you want to perform your testing from 05.03.2012 to 06.03.2012 (2 days), then from 12.03.2012 to 14.03.2012 (3 days), and then from 02.04.2012 to 06.04.2012 (5 days). As you can see, I got what I wanted. Task 1 will be performed at first week, Task 2 in second week, and Task 3 in next month! You should keep in mind that if a Task is effort driven but you assign both resources at once, duration and work remains the same. 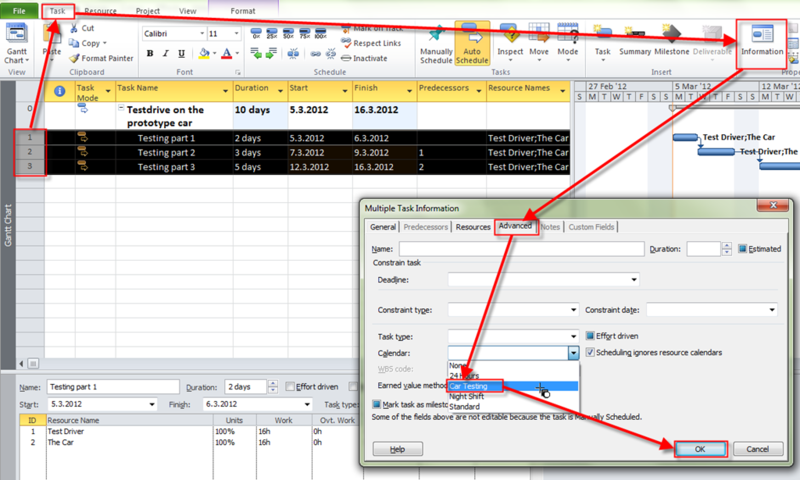 But if you first add one Resource to the Task, and after some time you add another resource then duration and/or work will be shortened, which depends of your task type (fixed units, fixed work or fixed duration), and you can read about this in my previous posts! 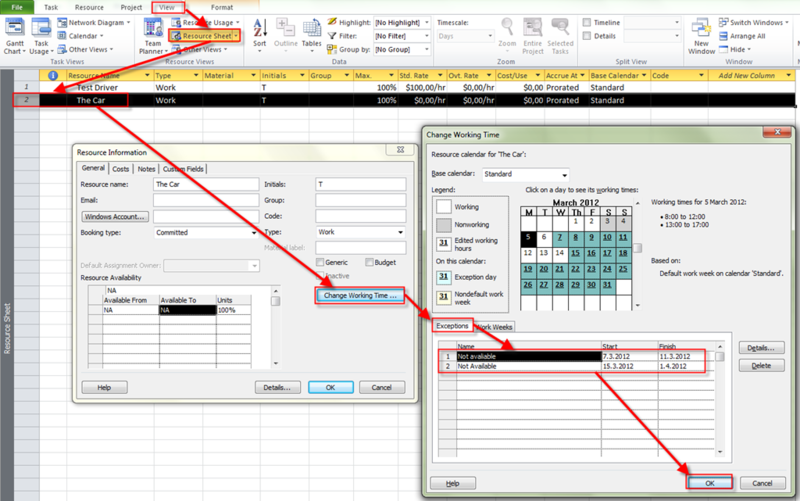 Second option is to use Resource Calendar! 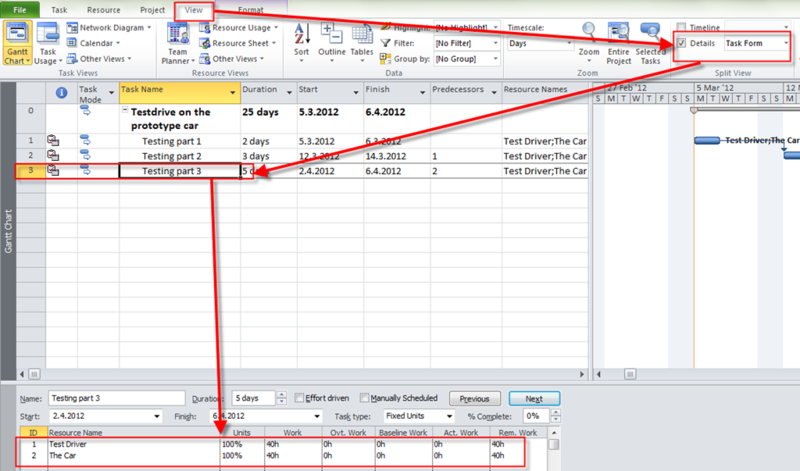 You want to perform your testing from 05.03.2012 to 06.03.2012 (2 days), then from 12.03.2012 to 14.03.2012 (3 days), and then from 02.04.2012 to 06.04.2012 (5 days). I will make an exception for the Car Resource since it is available for the testing to the Test Driver Resource in these particular days! 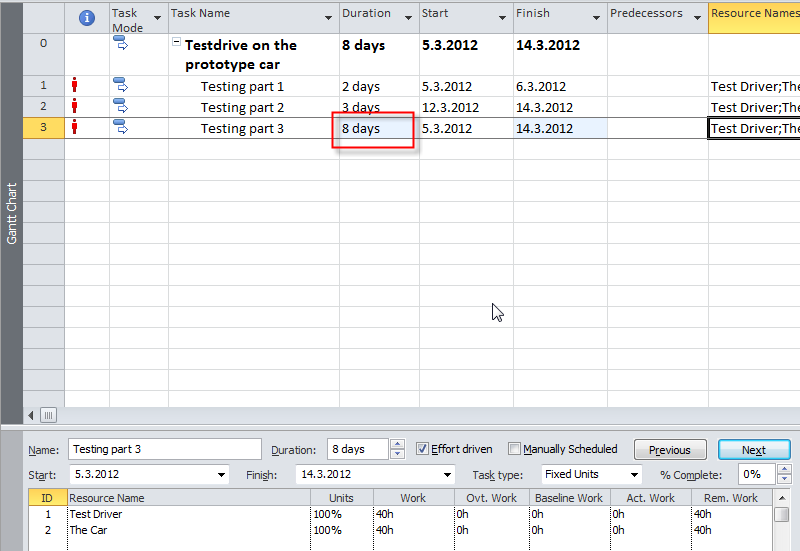 Now the Task 2 has 3 days duration from 12.03.2012 to 14.03.2012 (3 days), and everything is OK. This entry was posted in MICROSOFT PROJECT, Microsoft PRoject 2010, MS PROJECT 2010, PMI, PRoject Management and tagged Microsoft Project 2010, Microsoft Project 2010 - RESOURCES, MS PROJECT 2010 - assigning Resources, PMI, Project Management. Bookmark the permalink. 2 Responses to Assigning Resources to fit right time! Thanks for the wonderful post. Searching your Blog has become my everyday activity. 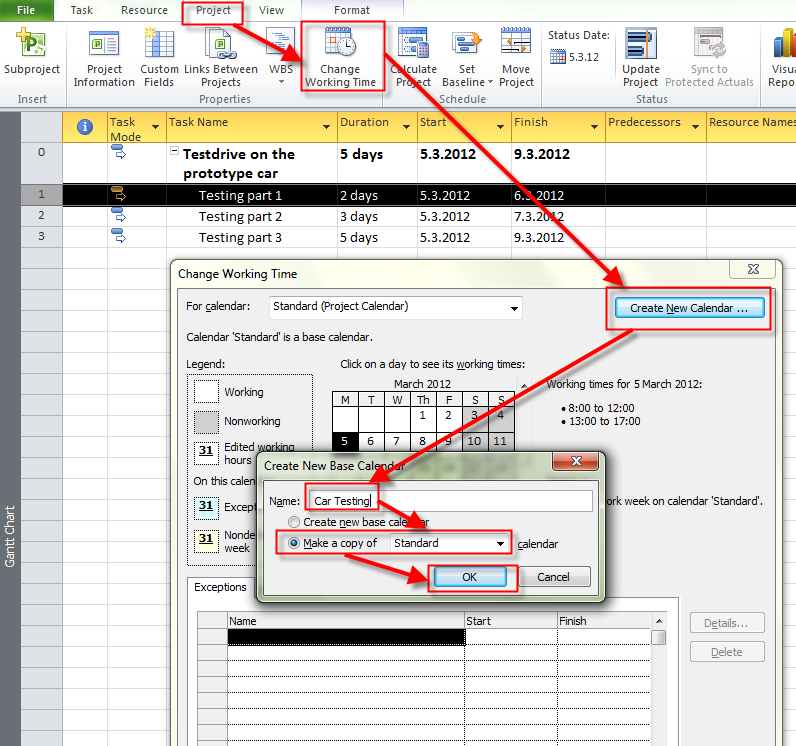 Is there any automaic way to do it in MS project.We are using ProChain Tool to do it. I don’t understand your question. Can you be more specific?